The quantum field theory (QFT) has unmasked a nature of Reality which is radically different from general human perception. According to QFT, the fundamental particles, which are the basic building blocks of the physical universe, are not the primary reality. These particles are simply the excitations of their respective underlying quantum fields, which constitute the primary reality. The ground state of a quantum field is the vacuum. The concept of void or vacuum is a cardinal concept in Indian tradition. The void or emptiness is denoted by the term śūnya. The word śūnya has been derived from “śūna” which means “to grow” or “to swell.” Though it generally denotes void, yet, in some places, it is also used as a synonym of “pūrṇa”; and therefore, it has also been identified with the concept of infinity. As the theory of śūnya evolved as a universal philosophical doctrine, it can comfortably be applied to shed new light on the unexplained issues of the quantum vacuum, which is considered to be the primary reality of the physical universe. 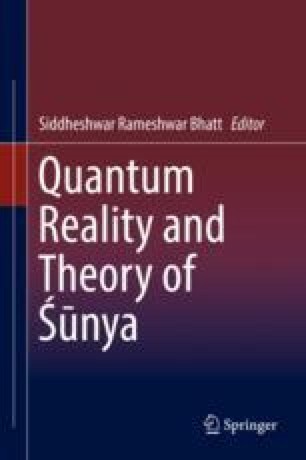 The paper explores some novel dimensions of quantum reality in the light of the theory of śūnya. But Reality is not exhausted within the purview of physics, and hence, there is dire need to discover other dimensions of Reality transcending the physical vacuum. The philosophy of śūnya is a wonderful theory which provides us a framework of knowledge useful to have an import of the Absolute Reality and its manifestations as different modes of existence. The paper also aims at utilizing the theory of śūnya to inquire into the Reality beyond the physical vacuum.